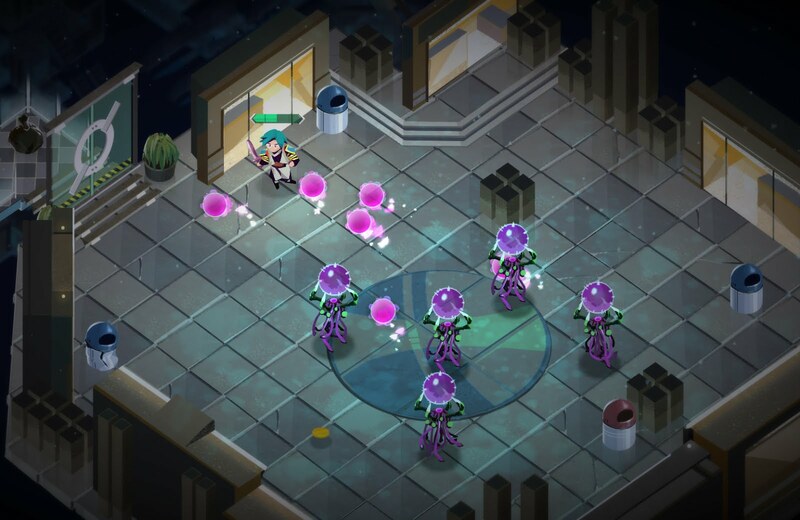 It is not an exaggeration to say that Boyfriend Dungeon is one of the most creative, unique titles I've ever had the pleasure of writing about. In the game, you fight your way through.a dungeon — totally normal, right? It sure it, until you add in the fact a major component of the title is to date your weapons. That's right, you become romantically involved with a weapon. When the last trailer for Boyfriend Dungeon was released last October, we were sure to cover it. How could we not want to talk about the self-described shack-and-slash game? The first trailer showed off the setting, a quite beautiful dungeon that contains monsters that need to be battled in real time. You're fighting through the dungeon to rescue weapons. Once something-someone is rescued, you can flirt with them in human form or equip them in weapon form to aid in your quest for victory. The Kickstarter is for the desktop version of the game; the developers aren't ready to talk consoles yet, if at all. The trailer revolves around the cat weapon. The game will receive a special weapon that is a cat in "human" form. Regardless, if you back the game, you get a cat to love for eternity! The game's developer says the title is an "inclusive, tasteful approach to gender and sexuality," but who thought that would mean a romantic relationship with a cute little fuzzy wuzzy kitty cat? Related reading: Speaking of romantic relationships cats, have you played Purrfect Date? My review of the game on iOS explains why you truly should get involved. It doesn't actually include a romantic relationship wth that cat. Instead, the cat named Pocket just wants a close friendship. But that's quite satisfactory too, no? 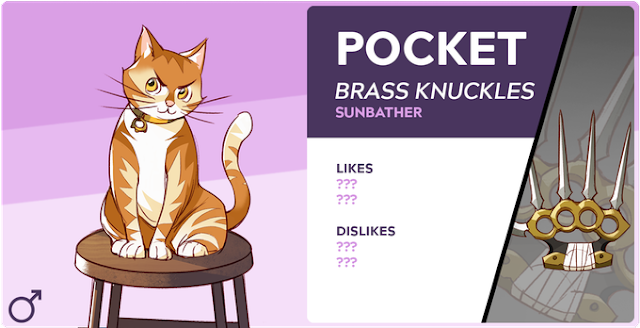 Pocket morphs into Brass Knuckles while in the dunj, so it's not shocking to learn he may take quite some time to become a lap cat. The trailer not only features the cat, but also other new weapon-babes ready to be loved. Like Sunder Talwar, a handsome long-haired red sword who likes to keep his buttoned shirt unbuttoned to show off the oiled-up rippled of his firm chest and abs. And there's super cute Valeria Dagger, with silver hair and wrists weighed down by gold bangles. *swoons* Isn't she just perfect? As a bonus, she loves high art (and hates ducks)! Or Isaac Épée, the deep-thinker who really owns the leather jacket he sports. The trailer goes quickly, especially for the last couple of characters, but pausing allows you to learn quite a bit about the weapons. Seven Lightsaber looks far too cool for school; with his white-blue hair and one earring, he enjoys chilling. That's right, I got one more cool pun in there! Sawyer Glaive fights for social justice while wearing a robo-emoji-type hoodie, a slouchy backpack slung over one shoulder. Boyfriend Dungeon is due out for PC in 2019. You can back it on Kickstarter in support of Pocket the Brass Knuckles. It is developed by Kitfox Games. For now, you can find me over in a corner muttering endlessly, hoping and praying for a console release.